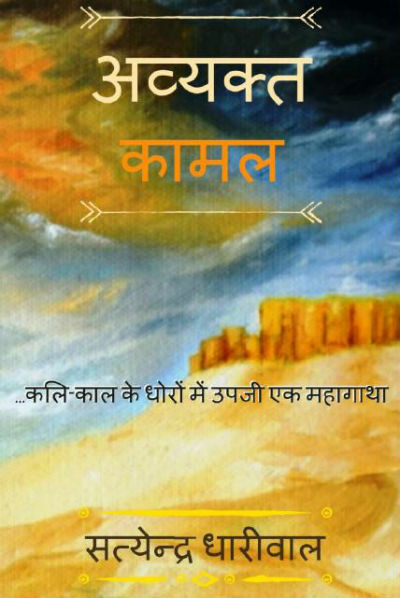 Recently I came to know about a book named Avyakta Kamal (अव्यक्त कामल : कलि-काल के धोरों में जन्मी एक महागाथा – The Involute Dunes: an epic saga born in the age of Kali) by young and aspiring author Satyendra Dhariwal. Though it is not his first book, but it is the first by him we got a chance to read. Fortunately, from our team, I got a chance to read it and I really loved it. Though it is a work of fiction but the author has incorporated some historical places and incidents quite interestingly into it. And so, I would like to consider it a historical fiction. The book is bilingual and is available in Hindi and English both. The author has provided us both the versions and this review is for the Hindi version of the same. Reading this book reminded me of another book we’ve reviewed recently, though it is a poll apart. How much we say that don’t judge a book from its cover page, a majority of readers are going to look at it that way only. Each of love good packaging, and that is the human psychology. Why otherwise we love the food items to be decorated and presented in a good packaging? Anyway, the cover page of the book has a light shade of cheerful colors showing a desert in the background along with the illustration of a castle. It is not very attractive. The book comes with a theme song for the same. This is quite interesting. Let us take a bird’s eye view of the book plot. The story is setup in historical time when the Islam started rising. India was still known as BharatVarsh. It was the glorious time of Bharat when it was a golden bird. The canvas of the book is setup at Jesalmer (aka Jaisalmer). The place is considered as the western gate of India (that is Bharat) because of its key position on the famous “Silk Route”. Mihirdev was ruling Jaisalmer those days. He was a very genuine, just and brave ruler. It was his time when Jaisalmer’s financial might was increased a lot. The traders from around the world used to come and do business with the city. On the outskirts of the main city of Jaisalmer, there was an entire city was established. And, it was a home of many local as well as foreign citizens. There were many so wealthy citizens were living in this city outside which are even wealthier than many of kings. So, there was a time of wealth and prosperity. And, of course, the peace too. Because, if the peace is not there, no economy can blossom. Mihirdev tried to manage peace at borders and during his time there was no war between Jaisalmer and Marvad; otherwise, both the kingdoms has a history being at loggerheads. Mihirdev was a lucky king who got a genuine wife who supported him in all his work. And, they were blessed with a curious, brave, intelligent and mischievous child named Kehar. Jaitang, the commandant of the armed forces of Jaisalmer was a brave and ferocious warrior whose bravery and war-skills were exemplary. His loyalty to the king and the kingdom was above all the material things. Actually, both the families had great relations which were carried forward in in the next generation as well. Prince Kehar, Subhau and Gaj enjoyed a friendship which is rare to exist. Mihirdev’s younger brother Lekhraj was the prime minister of the kingdom and enjoyed almost same power as the king him. Jalaluddin, a ruler from the fast east muslim kingdom was en route to Gurjardesh. The area which was very wealthy. Actually, the people of the area was considered quite soft. They were exceptionally good at business and a lot of wealth is earned by them. A lot of the wealth was donated into various temples and they were quite insecure. And, the big problem with Bharatvarsh of those days was the lack of the “concept of a nation”. All the small kingdoms were always at fight with each other and thus were not united. So they were the soft targets for invaders who wanted to loot the wealth. Jalaluddin was accompanied by his son Subuktagin and a large army of no less than 40000 soldiers. They were approached by a traitor from Jaisalmer. The traitor came with an invitation to attack Jaisalmer where he was keen to help them to let the kingdom fall! While, Jalaluddin was not convinced, Subuktagin seen a great opportunity for him in this proposal. Was Jalaluddin convinced to attack the invincible fort of Jaisalmer which is stand tall till these days (and is one of the tourist attractions of Rajasthan)? Who was the traitor and why he wanted his kingdom to fall? What the future holds in for Kehar, Gaj, Subahu and others? Who is Abdul Malek? Who is the mysterious gigantic human who came reciting the shlokas from Shrimad Bahvad Geeta? So many questions right? Well, you need to read the book to get answers. To read any of the books (or any media for that matter), the price is considered as one of the most important factors, I will however suggest you to consider your time (which you spend to read a book) even more important. So, the book price doesn’t matter much. At the same time, if the book is too costly, then it will keep many readers away from it. This book is available for Rs. 69 (Kindle edition) when I am writing this (both Hindi and English version has the same price), and in that aspect, it is definitely value for money. It seems that the author has a lot of influence of his native and folklores and think high about his motherland, which is visible in his writings. At the same time, the way he weaves mythology, history and even some of the problems which we face even in the modern days in the story is simply superb. He talks about the glory of historical times and the problem of internal conflicts and traitors in quite interesting way. The desert plays an important part here, and is no less than a prime character in the book. The author seems to be a well read fellow and has explored Indian mythology quite well. And, when we talk about Indian mythology, Mahabharat is something you cannot miss. The way the author understood the philosophy of Indian way of living is something you will be impressed. If you love reading the philosophies of life and beyond, coated with logical and scientific layer, then, you will find the chapter 26 of this book quite interesting. It seems the author has enjoyed writing it thoroughly. सीमा से अधिक लालसा इंसान को अँधा कर देती है, किसे डरने चला था वो मुर्ख! Though, most part of the book is focused on war and politics, the book comes with a message of peace. There are some interesting lines in the book which explores the emotions of common men in natural tone. इसका अर्थ हुआ की मनुष्य जैसा विचरता है, जैसा मानता है, ऐसा दृष्टिकोण रखता है, उसका सत्य वैसा ही होता है! The book has its share of printing/grammatical mistakes. So, by now, you got an idea about the kind and quality of writing you can expect form the book, right? Telling more about the content than this, will bring in some spoilers which I consciously would like to avoid. The other positive attribute of the book is its characters. They all are strong. The author has given proper footage to all positive and negative characters regardless of their gender. If the book is marketed properly and bring to potential readers, it has all the qualities of impressing readers and being a bestseller. In fact, the author has delivered something significant which even some of the bestselling authors are unable to. And yes, some people shall be interested in exploring the fort of Jaisalmer by reading this book. In that case, if a single reader is motivated in such a way, the book shall be considered successful in achieving its goal. The book is added with some maps and war plan illustrations, adding positives to the book. Overall, a nice historical fiction which weaves history, fiction and mythology in interesting ways. Strong characters and fast pace makes it gripping. The book is quite long in the length but the crisp writing doesn’t let the reader feel it. Around 8 to 8.5 out of 10.